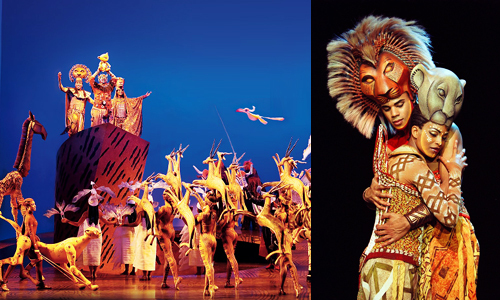 I went to the Lion King Musical at Marina Bay Sands last evening in two minds. One expecting to be wow-ed, the other really skeptical about how a musical can deliver the endearment that the Disney cartoon did. I grew up with the Lion King. I know all their songs by heart and crooned to them in the shower. I played Hakkuna Matata games on sega saturn consoles. It’s going to be difficult for any reproduction to ignite the same feelings of tender affection I had for the original cartoon. But the show started with a bang. In only a few minutes, the performers – in the most inventive and amazing animal outfits – managed to whoop up the excitement and spirit ala Mardi Gras. They came from all ends of the theatre to fill the stage, and the audience was treated to a resplendent display of zebras, leaping gazelles, an elephant, birds swooping overhead and even a rhinoceros! The cheetah is a puppet glove worn by a lady who moves with the lithe and grace of someone’s who is one with the animal she’s controlling. At that point I remember I had wished for three more pairs of eyes to fully absorb the details and movements of the parade on stage, but alas it’s over as quickly as it started. The musical continues to astound with the vocals, stage props, choreography and costumes. I thought Pumba, Timon and Zazu were positively shining performances. The hyenas were absolutely believable – I forgot more than once that these were actually people in costume. The cast was so professional and enthusiastic it felt as though were doing the performance for the first time. They didn’t deviate much from the original cartoon, delivering almost every tune with out a glitch. My partner particularly loved the energy of young Simba. He was impressed at how well-adjusted and well-rehearsed the boy was on stage. And that must mean a lot, because his favourite character in the cartoon is Simba as well. This entry was posted in Fun and tagged entertainment, fun, happy. The Lion King, musical by lifestartsonfriday. Bookmark the permalink.